The Chicago PMI is in negative territory, plunging to 48.7 from a prior reading of 54.4 and a Bloomberg Consensus Estimate of 53.6. Giant swings are common enough for the Chicago PMI which collapsed nearly 6 points in September to a sub-50 reading of 48.7. This indicates slight monthly contraction in the Chicago region's composite activity. New orders are below 50 as are backlog orders, the latter for an 8th straight month. Chicago-area businesses can't rely on backlogs as much to keep up production which is also under 50 and at a 6-year low. Contraction in prices is deepening. The Chicago PMI is expected to slow to 53.6 in September from 54.4 in August when delays in shipments gave the index a lift. Digging into to the Chicago PMI report we note Production Plummets to Lowest Since July 2009. The Chicago Business Barometer declined 5.7 points to 48.7 in September as Production growth collapsed and New Orders fell sharply. The drop in the Barometer to below 50 was its fifth time in contraction this year and comes amid downgrades to global economic growth and intense volatility in financial markets which have slowed activity in some industries. The latest decline followed two months of moderate expansion, and while growth in Q3 accelerated a little from Q2, the speed of the September descent is a source of concern. Three of the five components of the Barometer were in contraction in September with only Employment and Supplier Deliveries above the 50 neutral level. Production led the decline with a sharp double-digit drop that placed it at the lowest since July 2009. New Orders also fell significantly and both key activity measures are running well below their historical averages. There is no need to wait to October to understand the trend. A fundamental slowdown is pretty obvious. Illinois and Chicago in particular have huge issues. Manufacturers in Illinois have had it with tax hikes after tax hikes coupled with the most costly workers' compensation setup in the nation. And businesses are voting with their feet. In July, five firms left Illinois for good. A sixth, Hoist Liftruck, a manufacturer of industrial forklifts, announced plans in August to move more than 300 manufacturing jobs from Bedford Park, Illinois, to East Chicago, Indiana. I wonder how the economists all missed the slowdown. What the heck are they watching? Or are they still listening to Janet Yellen who insists this is all "transitory"? Tax hikes in the midst of a slump are precisely the wrong thing to do. Yet, a week ago, Chicago Mayor Rahm Emanuel announced the largest tax hike in history. For details, please see Chicago Tax Collector Hath Arrived With Massive Tax Hike: Emanuel Says "No Stone Unturned ... Not Done Yet". It will not be just businesses fleeing Illinois, mobile taxpayers will leave as well. And in fact they already have. As noted by Michael Lucci, Vice President at the Illinois Policy Institute, Food Stamp Growth Outpaces Illinois Job Creation 5-4 During Recovery. During the recovery from the Great Recession, the Land of Lincoln, alone in the Midwest, had more people enter the food-stamps program than start jobs. 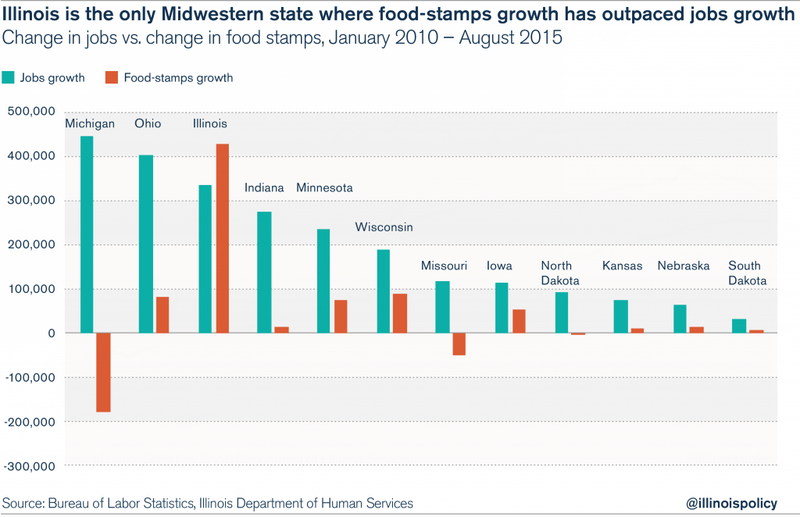 Food-stamps growth in Illinois has outpaced jobs creation by a 5-4 margin. During the recovery, Illinois put more people on food stamps than every other Midwestern state combined. And After losing 117,000 manufacturing jobs during the recession, Illinois has only regained 17,400 of those factory jobs since January 2010. Meanwhile, the other Great Lakes states have pulled far ahead of Illinois during the recovery. Michigan has added 135,600 manufacturing jobs, Indiana has added 80,400, Ohio has added 74,500 and Wisconsin has added 48,700. Illinois sheds manufacturing jobs and gains food stamp recipients. High taxes, a very poor business climate, especially Worker's Compensation procedures, are precisely to blame. So is inadequate pension funding and untenable pension promises. Illinois needs reform, especially on pensions and a slew of business climate changes. Yet Emanuel and the "progressives" think higher taxes and higher food stamp benefits are the solution. Rather than fix fundamental problems in the public union sector, Emanuel plans to leave no stone unturned when looking for additional revenue. What more do businesses in the Chicago area need to hear to decide to leave? Six corporations left in July and August, yet economists are surprised by the plunge in activity. Millennials will bear the brunt of these poor decisions. So I ask, Question to Millennials: Why Are You Not Mad as Hell Yet?